Team AWESOME your current defending Simbo Cup Champion and an original 8 team. Had his best season in 4 years with a 11-3 record. Coming off its worst season the year prior with a 6-8 record. 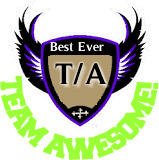 Team AWESOME is not afraid to make a move, they are the only team to make a trade all 4 season. Owner Kevin Stachowski believes they are never out of the playoffs. He says the team Slogan is No Retreat No Surrender.